My barn paintings have been put on hold while I have been tending to little ones. In times like these, when I find myself with no time to work, I always turn to knitting. Knitting can be done just about anywhere, sitting on floor playing lego or playmobil or holding a feverish clingy baby. It always gets me through, and helps me to hold on to my sanity. 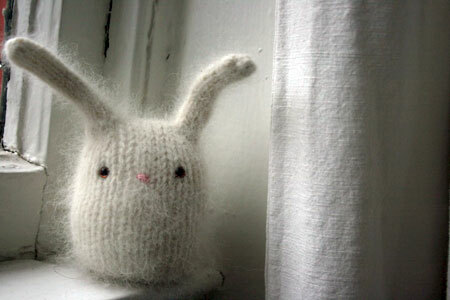 These bunnies were supposed to be Easter presents, but when you are knitting something this cute and fluffy right next to the person you are making it for, it is pretty hard to hide it. This little bunny (pattern free from RebeccaDanger’s site.) is a huge hit with Sosi. For Ila, I think I will make a Tofu dog (how can I resist that name?). So cute with that mohair halo. Nice job! YOu are an inspiration.